Bang & Olufsen launches BeoVision 10-32, its slimmest-ever TV | What Hi-Fi? Said to be the slimmest TV the company has ever made, the edge-lit LCD design is less than 7cm deep complete with its wall-bracket. 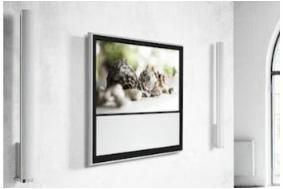 A novel design, with a polished aluminium frame surrounding a black square formed from screen and speaker, helps make the TV look even slimmer, and the wall-bracket allows the set to swing out to an angle of up to 45 degrees, folding back flat to the wall when not in use. It's also possible to change the speaker grille if required: a range of colours is available. As well as keeping it slim, the LED edge-lighting reduces power consumption to just 115W in use, or 0.5W in standby, and the set uses 200Hz/240Hz scanning, VisonClear technology and proprietary judder cancellation. Though the TV is kept low-profile, close attention has been paid to audio quality. As well as a 10cm bass speaker behind the fabric grille below the screen, complete with porting designed for minimal turbulence, there are also active two-way speakers for left and right channels, using a 5cm midrange driver and 19mm tweeter. All the speakers have individual equalisation and Class D amplification, and their enclosures are suspended in rubber bushings to avoid any vibrations affecting the rest of the circuitry. The TV, which also has a built-in surround module able to feed a complete set of Bang & Olufsen active speakers, is now on sale at around £4400.